Today, we went outside the hospital to help Catholic Charities with their refugee resettlement services. I was impressed with the dedication that local organizations have to helping the resettlement process go smoothly for refugees. Often, we see in the news the negative reactions that those around the world have to refugees coming into their cities. This experience was a reminder that there are still people willing to help refugees. Our specific role today was helping unpack storage units full of donated household items. We had very specific sheets filled with a list of items for each family. The items included everything from rice cookers to furniture. Interestingly, a specific set of federal guidelines exist for necessary resettlement supplies. The government contracted out these services to local non-profits. 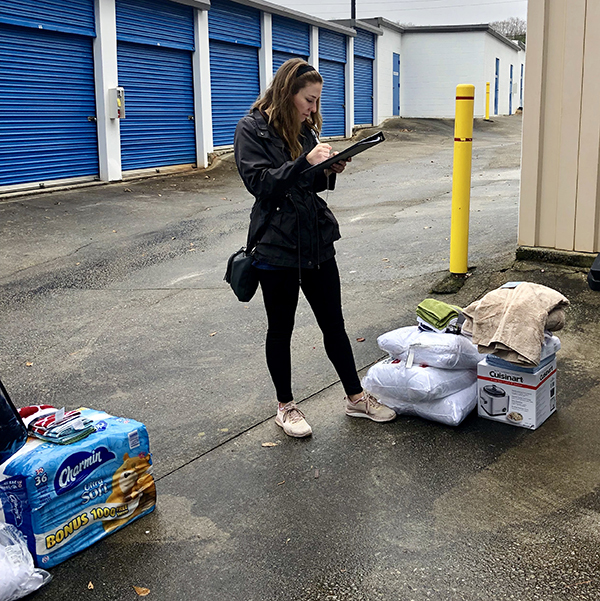 While loading the supplies into the truck for each family, I couldn’t help but think about how they were preparing for their long-awaited trip away from a refugee re-settlement camp. As the United States lowers the accepted number of refugees every year, many refugees around the world hope for this day, but it may never come. Next, we traveled to Clarkston, GA. A square mile town very close to Atlanta. The first stop was Refuge coffee shop. A quaint little place that hired local refugees living in Clarkston and supports ‘refuge’ for refugees, clever right? One striking thing I noticed while people watching in the coffee shop was the coexistence of many different cultures from all over the world in this haven of a city. My favorite part of the day came next, helping with the after-school program. The children were excited to have new volunteers come help them with homework and play outside. While helping with homework, the struggle of being in school while learning English was evident. A barrier also existed when looking at pictures of common animals, some of the pictures did not seem familiar to the children. However, some children quickly picked up the English material. I wondered if the children only remembered Clarkston as their home or if they remembered where they were born. I also thought about how many of the children might have been born here in the United States. What would that be like to not know the place where their parents were born? As we walked the children home from school, I thought about how important the Clarkston community is to the refugees. This community understands their struggles and triumphs as refugees in the United States.